The future of the power equipment industry is already written – not in stone, but in the wave of changes in the energy sources that will, in term, determine the equipment of the very near future. Let’s start with hydrocarbon fuels – petrol being the one we all know well and today powers the majority of our products using two stroke or four stroke, spark ignition internal combustion engines. It seems well accepted that petrol is going to get more scarce and therefore increasingly expensive. Auto manufacturers have long been under pressure to improve fuel economy, and have met that challenge. Our industry will not see the same fuel efficiency rules, though indirectly the emissions standards (which have been in place in the northern hemisphere for two decades, and are planned for Australia this year) will push the market toward quality, clean four strokes for the larger, ground supported equipment, which deliver 30 per cent better fuel efficiency. NSW and Queensland already have mandated the market volumes of E10 – a mix of 10 per cent ethanol, 90 per cent petrol. There have been some painful lessons when manufacturers ignored this change – and wrongly assumed that ‘petrol is petrol’. Ethanol is a powerful solvent and will dissolve fuel hoses and melt some fuel tanks. Well before any dangerous fuel leak, the dissolved fuel system compounds pass though the best filters and convert back into solids inside a hot engine, resulting in catastrophic failure. The confusion starts when engine manufacturers advise that their engine can cope with E10 – but they mean clean E10 – without any dissolved plastics or fibreglass. As a powerful solvent, E10 fuel spills will strip paint and damage some plastic components. In addition, E10 has a poor shelf life, low energy per litre, and in humid environments absorbs water and ‘phases separates’ out of the petrol. 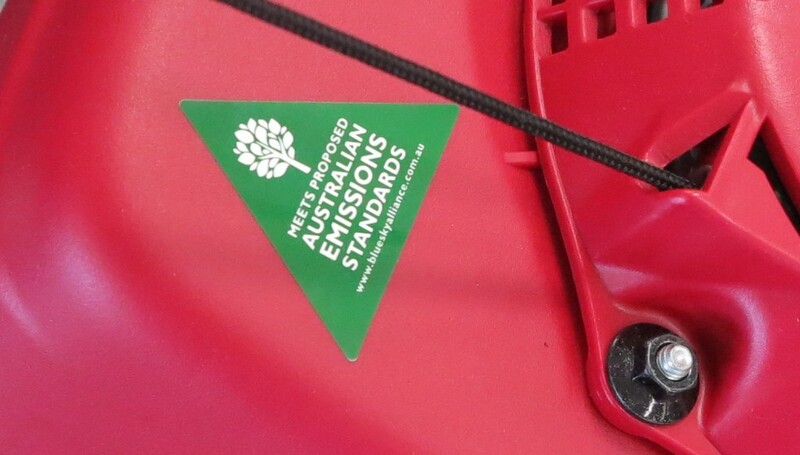 At least one Australian manufacturer has gone as far as ensuring all of their hoses and fuel tanks are E10 safe, while at the same time, adding a circular warning label to the fuel cap which reads: ‘DO NOT USE E10’. Covering all bases seems an idea worth consideration. The jury is out on the net environmental benefits of E10. It does reduce some pollutants in the inner city, but this is at the expense of farm production fuel burn and fertiliser usage. E10 is not favoured by the Greens, but rather the farming lobby and the conservative political parties. Expect pressure to increase the volumes; though tougher mandates and a push to E15 – a 15 per cent ethanol mix -within a decade. Like Ethanol, Biobutanol is also produced from fermenting farmed crops, but Biobutanol is closer to gasoline, and without the nasty side effects. We are beyond the experimental phase with Dow chemical and BP running a trial plant in the UK. Though promising, it will be hard to get the ethanol producers to rebuild their facilities and produce a fuel that is not so different – just slightly better for consumers. There are other hydrocarbon fuels. Going to a heavier fuel such as diesel does not seem to have been explored by small engine manufacturers – probably because of the need for a battery to heat the glow plug. Lighter HC fuels are all gaseous. Methane, propane (LPG) and butane (C2, C3, C4) all require heavy pressurised containers and have about 30 per cent less energy per litre than petrol. So you need to carry a lot more and, with its storage tank, the whole package is much heavier that the equivalent petrol machine. Not to mention more challenging to refill. We do see LPG forklifts, outboards and some limited power tools, but the natural drawbacks will always limit usage. Electric products are already well entrenched in the smaller, domestic end of the power equipment industry. Even in my own home we have seen battery drills move from light weight novelty items to serious hammer drills that can keep a tradie going all day – as long as he carries two spare batteries and charges them every night. The shortcomings of battery tools have always been the long charging times and low capacity, or alternatively, high weight with one huge, or several spare batteries. We have seen many improvements despite the occasional flammable phone, but investors are looking for another giant leap, such as what we saw from NiCad to Li-ion batteries. The rapid development of electric vehicles means huge market potential, and thus lots of promising research on battery technology. One such project that caught my eye is a rapid charging system out of Nanyang University in Singapore. Engineers can charge their modified Li-ion battery to 70 per cent in two minutes and full capacity in five minutes. That puts the refuelling convenience close to petrol cars, and means only a slight modification to existing lithium battery production, which makes it a winner. The auto industry does not hold a monopoly on electric propulsion. The German Torqeedo company has been delivering reliable electric outboards for small tenders for a decade. Their flagship model now delivers 80hp, enough for a family boat or to pull a water skier. Mind you the 340volt, 150kg battery is a bit of a monster! Advances in battery technology are being mirrored with increases in engine efficiency and design as well as the designed efficiency of components such as the fan blades on a garden blower. Designers are starting with a blank page – so expect some radical rethinking. As soon as you add a battery and make electric current available on a power tool it opens up a whole world of whiz bang features that help to make the consumer choose one brand over another. Consider the humble iron that now has sensors and auto cut out safety features. Or the toaster with a memory of how burnt you like your breakfast. What features will we see on PE? Briggs & Stratton has opened that particular door with a mower that runs on petrol but has a rechargeable Li-ion battery pack for electric starting. ‘Just push the button and mow’ tells me that the InStart feature comes from really listening to the modern consumer who has been leaning toward the on/off convenience of electric mowers. It is near impossible to find a motorcycle without electric start today, and I predict the same for mowers within five years. What features will sprout up, now we have electricity on board a petrol mower? Electronic fuel monitoring? Oil quality and service indicators? Noise reduction circuitry? Some features will come under the category of ‘cute but useless’ as marketers scramble for consumers’ attention, but others will become standard fare – just like ABS and Bluetooth connectivity in cars. If you are not familiar with fuel cells, I find it easier to consider it as a battery that consumes some sort of fuel. It is not disposable nor is it rechargeable, but like a disposable battery it produces electricity though a chemical reaction. With a fuel cell you get to top up the chemical/s. The most common fuel source is hydrogen. Today you can pick up a hydrogen fuel cell suitable for recharging a phone, complete with disposable hydrogen packs the size of a AA battery – all delivered for $165 and ready for the next flood, cyclone or camping trip. The problem is the fuel source. Hydrogen costs a lot of energy to extract from water or air. The benefit being the ‘exhaust’ is clean water – cleaner than the water out of your filter tap. To store or pump, hydrogen needs very high pressures, heavy tanks and expensive pumping equipment. For example, an LPG bowser at your local petrol station costs twice the price of the petrol bowser beside it. A hydrogen car filling station needs to be a dedicated facility and costs more than ten times a petrol facility. And those are the kind of costs all along the supply chain. BMW dabbled in hydrogen cars and Honda is active in hydrogen fuel cell (electric) cars which will lend the type of development muscle that will see technology filter down to small engines. Hydrogen is not the only fuel cell input. Aluminium-air and zinc-air fuel cells all have promise and some serious research – and all have disadvantages that need to be overcome. For now they are high risk investments. What is left is a rainbow of hybrid fuel systems. I am going to stretch the definition and call Briggs & Strattons’s InStart the first hybrid mower. There are many other hybrids being trialled – hydrogen and methane fuel mixes, buses running on parallel hybrid systems of traditional batteries and fuel cells to help with take-off power bursts. The future is crowded with promises. The best the Australian power equipment industry can do is keep abreast of changes, especially changes in other sectors like the auto industry and even camping equipment. Training bodies need to prepare todays apprentices by refocusing the syllabus on electronics and electric motors, even before electric products dominate the market.